in Burera District in December. The topic is breast cancer. The demands of family and farm leave little time to worry about it. And anyway, it’s probably just from breastfeeding. But after a couple of weeks, the 35-year-old mother walks over to chat with her neighbor, a community health worker, about the hard little knot near her armpit. Concerned, the community health worker suggests she visit a health center down the road. At the health center later that month, the nurses also aren’t sure what to make of the bulge in her breast or the persistent ache she is now experiencing. They prescribe pain medication. After three return trips to the health center and three failed courses of antibiotics, the woman finds herself referred to a district hospital. On the day of the appointment, she rides a motorcycle taxi for half an hour and a bus for two hours, carrying her baby on her back. At the hospital, she meets a nurse who listens to her complaint and asks her to remove her igitenge top. Underneath is a tumor that has been growing unchecked for a year and a half. The mass is three inches in diameter—so large that it has broken through the skin and begun to bleed. Another patient watches the woman’s child while she is biopsied, bandaged, and discharged, to return for her test results in two weeks. Only then—if she’s lucky, if her cancer is not clearly stage four—will a grueling treatment regimen begin. Such is the confusing, frightening, and exhausting experience of a typical woman suffering from breast cancer in rural Rwanda. Partners In Health—or Inshuti Mu Buzima, as PIH is known locally—and the Ministry of Health have been fighting cancer together for years, even before the 2012 opening of Butaro Cancer Center of Excellence, an oncology clinic offering rare pathology-based diagnosis, chemotherapy, surgery, long-term follow-up and support. Since 2014, PIH has increased its focus on breast cancer, the most common cancer seen at the Center. People tend to think of cancer as a rich-world problem and in many ways they are correct. A far higher percentage of women in the West end up with breast cancer. In the United States, 753 out of 100,000 women will develop breast cancer in a given five-year period; the corresponding estimate in Rwanda is 54 out of 100,000. But rates in Rwanda seem to be rising. This could be because breast cancer data is getting more accurate or because declines in infectious disease are allowing women to live longer—and die of causes such as cancer. What’s known for sure is that delays in treatment cause more women to die than should. Between 2012 and 2014, staff from PIH and the Ministry of Health conducted a study that found the median time from breast cancer onset to diagnosis was 15 months, or roughly six times as long as it would be in a country with widespread routine mammograms. The effect is obvious. “So many patients come in with large, painful, fungating cancers,” says Dr. Lydia Pace, an instructor at Brigham and Women’s Hospital in Boston and the Center. To prevent this, PIH began the current pilot program in 2014. 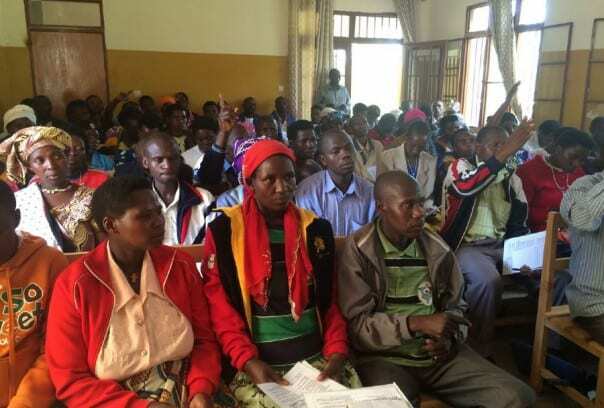 Pace, Cancer Care Nurse Coordinator Vedaste Hategekimana, and colleagues trained community health workers in a handful of locales in the northern Burera District about the basics of breast cancer. “Many in the community took cancer to be a disease that killed a person immediately,” says Hategekimana. So far, they have explained the signs, symptoms, causes, and treatments of breast cancer to 1,100 community health workers. They also taught nurses at the local health clinics, using a rubber mannequin to practice evaluating symptoms, performing a clinical breast exam, and more. Lastly, PIH set up a special clinic within the Center to expedite management of breast cancer patients. This month, nine clinicians are mastering a new ultrasound device that will allow them to quickly distinguish between cancerous and non-cancerous breast masses, speeding up treatment and discharge. Comprehensive results of the program are forthcoming but look promising. Nurses scored an average of 92 percent on their training exams. And community health workers and nurses are sending 10 to 20 patients per week to the Center. The Ministry of Health is of course interested in a nationwide rollout of the program but knows it must be cautious. Rwanda has just two full-time oncologists and must send patients to Uganda for radiation therapy.